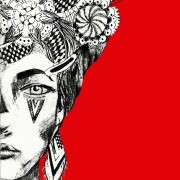 Born in 1994 in El Salvador, Eugenia discovered art at a young age and nurtured it ever since. 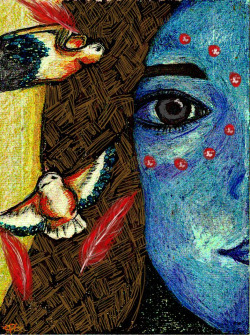 Without any professional education in art, Eugenia has participated in two art festivals (Festival Bicultural 2011,2012) and received workshops with recognized Salvadorean Artists. 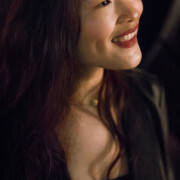 In 2013, she moved to Taipei, Taiwan. 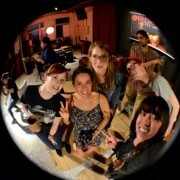 Last year, she participated in Exposure: Art, Beer, Culture 2014, to get involved with Taipei’s artsy scene. Currently, she is pursuing a degree in Journalism and Mass Communications and coloring the void between her career and the art field. She describes her art as over-saturated by colors and patterns, reflecting the complexity of the journey of human experiences and interpersonal relationships. “It is euphoric up there. You feel bliss. 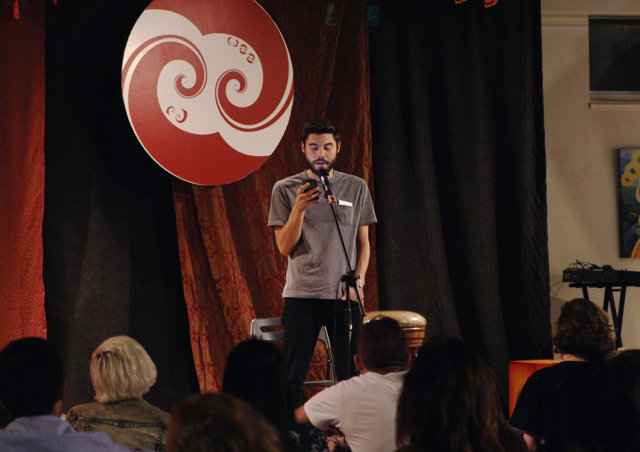 Your writing is better spoken out loud.” Alex Schmoyer is a Red Room regular, performing every month since his arrival, a foundation in creating our vibe. In January 2014, being a new, fresh face to Taipei, Schmoyer was eager to find the must go to spots. 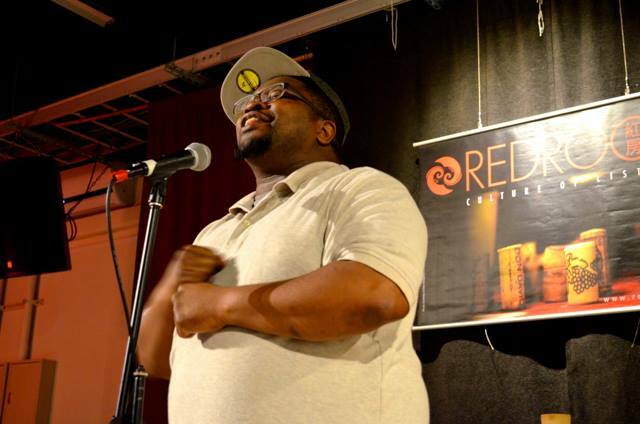 After a co-worker told him of Red Room, he has assimilated into the community, making Red Room his creative space and poetry platform. This new atmosphere of RR provides for a clear headspace of the power and attention that spoken word deserves, as well as Schmoyer a chance to share. He has been around poetry his whole life. His father also a poet has been pushing and inspiring his creative energy since he was young. It was not until Schmoyer moved to Taiwan though, that he began writing more prolifically and seriously. It became a part of his everyday. Poetry is fun. Frustrating and difficult, but fun. He finds that it is more manageable than prose, you can wrap your head around it. Poetry isn’t just his creative outlet, but his talent. A poem can talk about anything: film, news, media, an action, idea, or feeling. Schmoyer likes to explore the accessible, making it more particular, bending it into the absurd or nonsensical. His work oscillates around and through music, film, the sensory, and the cerebral. These inspire him to explore either by trying to capture the feeling of a song by listening to it on repeat for hours or by examining the current news on possible life forms in another galaxy. He will listen to an album or a song on repeat just to capture that feeling you are left with at the end of a beat, lyric or camera shot. Film is where it all started. Stanley Kubrick got him into film, and actor John Cassavetes, known as the “father of American independent cinema”, as well as Werner Herzog, the eccentric director of Grizzly Man and Aguirre, the Wrath of God, kept him in it. All three men kept him hooked in film and keep him constantly coming back each as a source of creative energy. Schmoyer doesn’t read much poetry. It feels too close to meter and rhyme. Each being characteristics in formal poetry that can put too many constraints on your creative headspace. Schmoyer prefers lyric-less electronic music, Modest Mouse on repeat, or the occasional limitation of a formal haiku as sources of inspiration. I burst through the doors of The Toasteria, out of breath and late. As I approached the stairs a man in black appeared. “Are you looking for Ted? He’s upstairs,” he said gesturing past staggered rows of drawings. 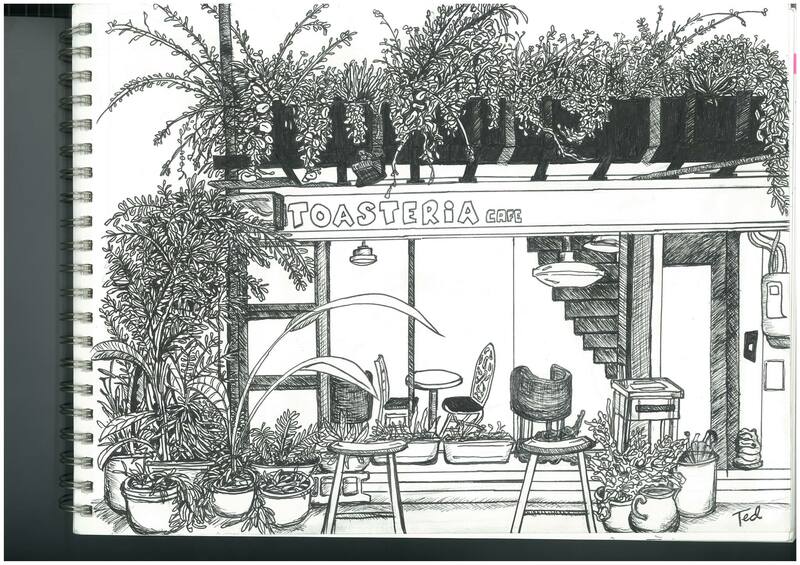 Ted Pigott had been drawing over his lunchbreak at the Toasteria for a year when the owner of the restaurant asked him to display his drawings of the scenery and the food. The drawings in question featured a variety of styles from point work, to watercolor, black and white ink sketches, to colored pencil. Each drawing was encompassed by a simple, matte black frame. Though the frame stands out from the white walls of the Toasteria, it doesn’t dominate the space nor does it obscure the art. Like the artist, it eschews ostentation and exhibits a genuine, relaxed feel. While some artists may define their main inspiration as another artist or as a lofty philosophy about what art should be, Ted’s philosophy is often delivered through a series of simple mantras: Draw what you see. Share what you draw. Every day is better when you draw. As long as he has his pen and pad of paper, he’s happy. In fact, his Facebook, which is covered with portraits of strangers, flowers, scenery, food, is a testament to his philosophy. As I opened up the menu, Ted leaned over to recommend the three cheese omelet. “It’s my favorite. That’s why I drew it twice.” He chuckled. Sure enough, the wall behind us featured two omelets: one in color, the other in black and white. I looked back at the drawings for a moment. “Did you ever envision, when you were young, that this would be your life?” I asked him. He confessed he hadn’t. 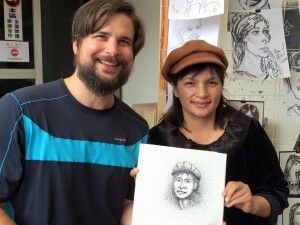 In fact, he hadn’t drawn for over two decades when he picked up his pen again in 2014. It all started with a single line drawn over his lunchbreak. He had a sketchbook and, as the server placed a coffee mug in front of him, he decided to pick up his pen and try to draw it. “It probably wasn’t that good,” he told me. “But at least I did something that day for myself.” What began as a hobby soon became his full time job when he began sharing his work on Facebook. He speaks highly of the internet which has allowed him to share his art and aided his getting noticed by the Toasteria and the Red Room. He has since largely overcome the fear and excuses he made for himself before that year. When I asked how an artist might overcome such a fear he replied “It doesn’t have to be perfect. Just get it on paper. Draw that first line.” After that, it’s just honing your craft. Throughout the video he maintained that anyone could become an artist if they wanted it enough. The way to do so is simple: Do what you love, love what you do, the rest comes from diligent practice of your craft. Perhaps most important to Ted is his passion and his independence. He espouses the importance of following your own perspective and maintaining your own artistic integrity. He claims the internet is a large part of what has allowed him to sustain that independence. “The world is my studio, the internet my gallery,” he told me toward the end of the interview. With a sketchbook and a pen he’s happy wherever he goes, as long as he can draw what he’s passionate about. If you’re looking to speak with Ted about his art, you might find him at a Red Room event, with his notebook and pens out. His drawings of the Red Room community, as well as other things he likes, are currently featured at the Red Room for the month of November. If you’d like to view Ted Pigott’s art, you can visit the Red Room where his art will be displayed next to JJ Chen’s for Red Room’s second installment in the Visual Dialogues series. You can also hear more about their art and their involvement with the Red Room at their Visual Dialogue Vernissage on November 18th. 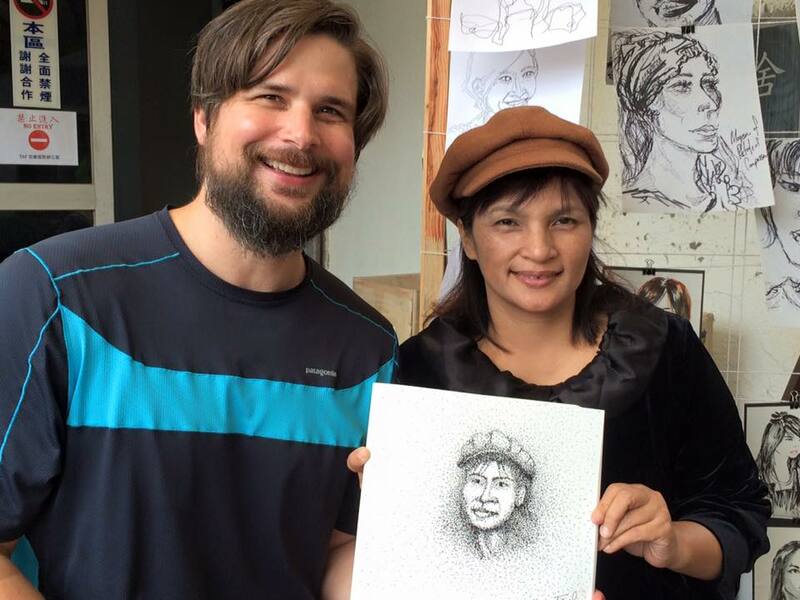 You can read the full interview below or visit Ted’s Facebook page to see more of his art. Did you ever envision, when you were young, that this would be your life? No, I never did. That’s why I stopped drawing for twenty some years. I was working full time as a consultant nearby here, so I was traveling around and very busy, but then one day I thought “Hey I need to do something for me.” Before I’d work at my desk; I’d have meetings; I’d read Bloomberg business week. I thought I needed a bit of a change. So, number one, I thought I had to get out of the office. I thought I’m going to walk around and see the neighborhoods. Number two, I wanted to find good food and a good place to sit for the full hour—not like a dumpling place, not a noodle shop, not like a café. And the third thing was I wanted to do something I wanted to do. [I didn’t want to] read work e-mails, or do copy writing. So I had a sketchbook and I decided that “hey, maybe I should try to draw this coffee cup”. So I just tried to draw it, and it probably wasn’t that good. Then my food came so I closed the book and I ate. It probably wasn’t that good but at least I did something that day for myself. You spend so much time doing things for somebody else that it’s rare you find time to do something for yourself. Anyone can do it. You can work on a play. You can draw. You can do whatever, but you can take that one hour and give it to yourself. [You should] not just sit and watch the news, or trying to get ahead of work. It’s up to each person. When did you start deciding you wanted to exhibit your work? It seems like something that started to decompress, something to do for you. When did it become something more than that? Well, I started sharing my work on Facebook. Share your work. That’s another philosophy of mine. Social media is the best way to do that. Before all my stuff would just be in my sketchbook and you would never see it. You might see it and think “Oh, he’s got a sketchbook.” But you would never see it unless I showed it to you. Now if you like my page, if you are my friend on Facebook you know I draw a lot. It’s a great way to share. Also, if I show you my sketchbook now you might feel, out of politeness, “Oh, that’s good” or they don’t know what to say but they see it on Facebook by themselves, they might think “Hey I’ll give it a like”. I think the internet to day is very visual. If you write a story, a fictional story, not a lot of people are going to read it. 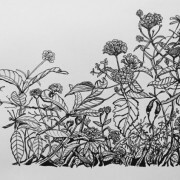 They might think: I’m not going to read this, it’s too long, but a picture of flowers? ‘Like’. I like that. So it might make someone’s day a little better. It connects with people a little quicker than written word? It’s more accessible? I think so. I think because it’s so visual and it’s a picture. It’s not a photograph, it’s different. You’ve taken some time to draw something so it has a more personal feel to it. You draw something and people like to look at it. [Photographs are still useful though—especially with camera phones.] Before I had to scan it, but phones are so good I can just take pictures of my drawing and upload them. That’s how you share you work and [phones] are a very valuable tool to help you share. Another mantra is “Draw what you see”. Do you mean that literally? Do you feel there’s so much to see that it’s better to render ‘real life’? That can be taken quite a few ways. That could be taken literally, or it could be like what you draw what you imagine. Draw what you see. The first part of the mantra is just draw. Every day you gotta draw –draw, draw, draw. Then what you see is the things that you, as an individual, see. I see these flowers, probably in a different way than you see these flowers. I gotta draw what I see. It can be imaginary, I’m not saying everything’s gotta be realistic but it has to be from your perspective. My perspective is probably different than yours. [Your perspective is different] in more ways than one. Yeah, exactly, the things I see are different. You live in Zhongli and I live in Taipei. I’m a man and you’re a woman. I see things differently than you. I’m interested in these flowers, MRT, beer, what I see what I ride around in Taipei. I don’t draw a lot of temples. I don’t go to a lot of temples [because] that’s not what I see. You have to draw your passion. That’s another one of my mantras: Draw what you love, love what you draw. You gotta love what you draw. You have to draw what makes you excited. This [three cheese omelet] I like a lot. Beer, I like a lot. Pizza. These are things I like. These are things that make me excited, make me want to share. I’m not forced to draw something. You don’t force yourself to draw things you aren’t inspired by. Yeah. I think it’s possible to draw things you aren’t inspired by but I don’t think it has that same feel or magic. That’s what an illustrator has to do. They have to draw pieces they don’t want to draw. I’m not interested in technically possible. I think something that really moves people has to come from a place of passion. When you first started you said your drawings probably weren’t that good. I feel a lot of people, especially beginners, they tend not to get past that stage, the ‘It’s not good stage’. How were you able to push past that? Were you able to do it because you told yourself it should be about you, about relaxing and de-stressing? How did you get yourself in the mindset to continue drawing? Then, when you decided to pursue it in a more serious way, that is, in a way that would allow for exhibitions, how did you transition from it being more personal, and private to public? Did you change your mindset at all? That’s a tough question because I think it’s a real paradox. You care about what people think, but you also have to not care what people think. You know, you put stuff on the internet; you put it out there; you share your work. You have to just be strong enough to put it out there. People are going to criticize it. They’re going to take it in ways you didn’t think [about]. They’re going to make fun of it—all that kind of stuff. But who cares? You can’t care. That’s another one of my mantras: Don’t think. Just draw. Don’t think about what they’re saying. Who cares what they’re saying? Don’t think about what they might say about it. Draw it. Make it. Get it out there and then post it. If they like it [then] they like it. If they don’t then you still drew it. You can’t take that positive or negative feedback too seriously. It’s kind of just noise. You’re going to do it anyway. If you really love it. I would draw even if I couldn’t share it. It helps to get feedback, to know people are seeing it but I’d still do it even if I couldn’t share it. Of course it’s nice to get validation. Of course it is, but you can’t let that control you. “I think I know what people want to see,” that’s where you get into trouble. A lot of people are suggesting I publish a book [because it’s popular to do so]. You know, maybe what’s popular is not really my passion right now. 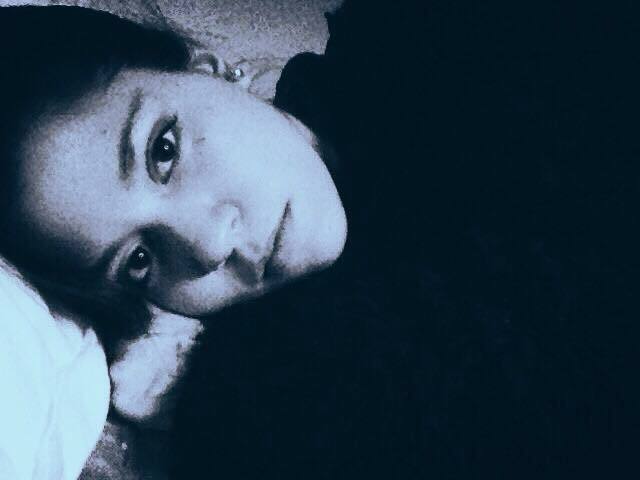 Maybe I could, but I don’t know about now. You have to do what you like. So, maybe, in the future you might do so? Yeah, maybe, I mean I’m open to anything. You’re not concerned about the future. You’re just enjoying the present. Yeah, maybe, maybe [I’m] not enjoying but just doing. [I’m] sort of, like, thinking: don’t think, just draw. You have to draw every day. That’s just me. It could be you gotta sing every day, you gotta draw every day. You gotta make something every day. You have to do it for you. I think a lot of us just sit back and we watch five season of Breaking Bad or we gotta get caught up on Homeland. There are so many great shows but, maybe, you should do it. You have to just do it—create something. I don’t know. There’s room for both. There’s a balance. You can get some inspiration from shows, they’re very well done, but someone else made those shows. Most of us just sit and watch them. Let’s all go and make something. I’m really passionate about that. I think you have to make it yourself. I do keep all of my drawings. I think a famous artist once said no piece of art (or novel or whatever) is ever finished–it’s just abandoned. And sometimes you may return to them later, just to look at them again or to try to learn something from them or even to add something new. In any case, I do think 2014 was a big year in my life, when it some to learning and discovery, as you mentioned. I still feel as if I’m learning every day, though, and I still feel there’s so much left to learn. And now you have an exhibition here. How did that happen? Well the owner saw it on Facebook and he really liked it. He’s an artist himself, he’s a musician. He really appreciates the passion I put in. He contacted me and asked if I would like to exhibit. I selected sixteen different drawings. Over the course of a year I sat in different places and drew then I brought them all together and we picked the ones we wanted to show. He was really nice to give me free reign to decide what I wanted to show. That’s why I like the internet. Before you had to go to gallery owners and beg them. You had to beg them “Please, please show my work.” Now, you can just post it on the internet. It doesn’t have to go viral immediately. It doesn’t have to get a million views, but you can build an audience. The world is my studio, the internet my gallery. I’m now looking at your website and I see this picture of the Toasteria. Yes! 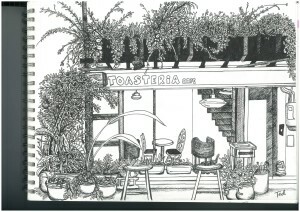 It’s the outside of the Toasteria. All the drawings I did for this exhibition were done here over the course of a year or so. So this is the place I would come to draw– here and a few other places—and I’d sit here and draw as much as I could. In September of last year I left my job and drew full time, freelance, and did some freelance writing and editing. Mostly my whole thing is just to draw I try to make myself my top priority. It’s easy as a freelancer to take case you don’t want to do, but if you do that a few years later you’re going to have a lot of drawings but nothing for you. I try to limit that as much as possible so I can draw for myself. It seems you really value your independence, and you follow through on your passion. I’m very lucky. I feel blessed to be doing what I love. You know, other people might not be so lucky. They might need expensive equipment, a studio. All I need is a sketchbook and a pen. That’s all I need and I’m happy. 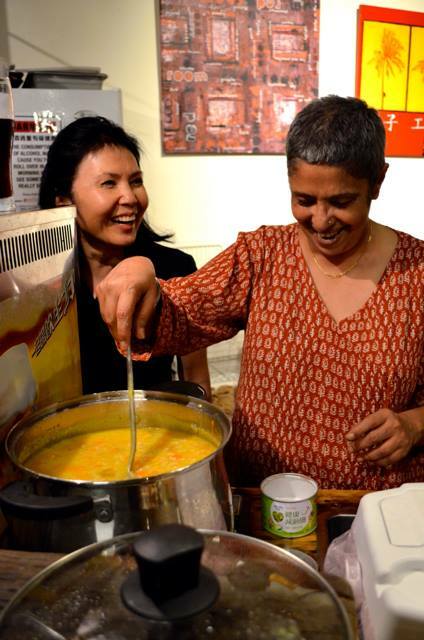 A round-table read-aloud where guests will be welcome to read from a collection of poems and short prose on food. Everyone is encouraged to bring short pieces of poetry or prose, original or otherwise, on the theme of food. 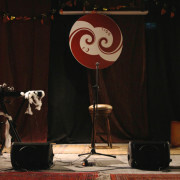 A variety of recorded music will accompany the readings. We will be joined by special guest readers from the performing arts community of Taipei and environs. Works by DH. Lawrence, Mark Strand, William Carlos Williams, Maya Angelou, MFK Fisher, Roald Dahl, Tennessee Williams and others. 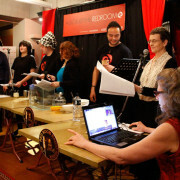 A MAD TEA-PARTY faithfully adapted for radio drama by Red Room Radio Redux* from Lewis Carroll’s ALICE IN WONDERLAND. 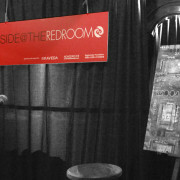 ***Red Room Radio Redux is part of the Red Room Community “dedicated to listening”. 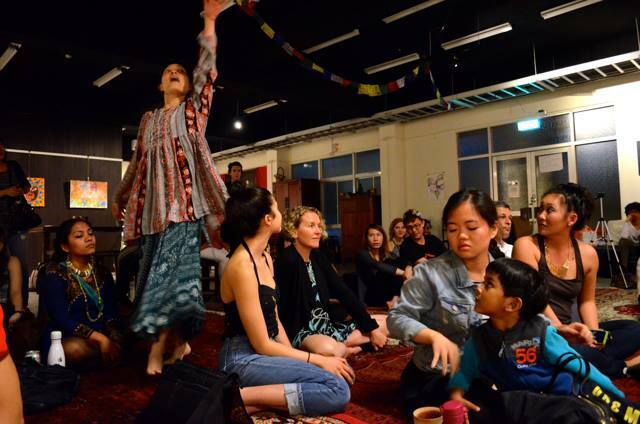 The Red Room is an ever-expanding community, exploring and extending the boundaries between audience and performer; a not-for-profit platform for events developing a culture of learning to listen to each other, what is around us and our selves. Our sponsor is the Ripplemaker Foundation, enabling people to realize their dreams by supporting entrepreneurial, social, cultural and environmental projects. Ripples change lives. Ticket price includes a selection of raw canapes and wine. Drew’s Drama Sessions are back! This Sunday we had our welcome-back-class. It mostly consisted of games and exercises in ideas and themes we had covered before the long break, which included Charades (of animals), and telephone. Afterwards we did exercises in the the 8 effort actions. Followed by an introduction to the Hieratic gestures (gestures that have dual meanings, and are used across cultures and time periods), as well as exercising using different centers of movement and motivation (moving with the heart full or empty, moving with strong or weak bones, etc.). For the next class we will begin to delve deeper into the Hieratic gestures, as well as continuing a review of previous lessons. As I have mentioned to some of the parents this past Sunday, we will be working under R4 in an afternoon performance with our own performance of Dr. Seuss’ Green Eggs and Ham, and Cat in the Hat. This means that we will also begin to incorporate text into the lessons, and begin learning about interpretation and performance of text. RRadmin http://redroomtaipei.com/wp-content/uploads/2017/05/RR-logo-2017-500x122px.png RRadmin2015-02-26 11:58:342016-02-17 00:51:42Drew's Drama Sessions are back! I’ve been listening to those audio files and pairing the​m​ with some Great Western Music ​ in preparation for the mixing process which will start in a few weeks.. The folks at ICRT are especially keen on our Sherlock Holmes story: A Scandal in Bohemia.​ They recommend creating a series and the Holmes/Watson stories of Arthur Conan Doyle could be a good choice. 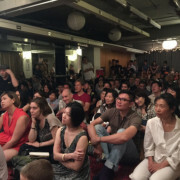 Incidentally, Pat Woods and Charlie Storrar read our Ignatz Ratzywatzky’s adaptation of the SCANDAL aloud at the Taipei Literature Festival on August 2 at Huashan Park. Meanwhile, William Openshaw of the RR video-recording division has been working on a video of our WasteLand performed at the April Aside @ The Red Room​.​ He and I will meet in August to take the next step towards a functional promotional video for R4. Lastly but not leastly, with a deeply appreciative bow to Roma Mehta: the R4 portfolio has passed the design/development stage and gone to the Printers! Looking forward to putting that item ​to work making ​good​ connections ​with potential clients​.